An exciting new product line of Funko Vinyl Pops based upon the iconic artwork of legendary artist, Jim Lee. Some previous deluxe edition figures have included, Batman (Hush), Aquaman, The Flash, etc. Each figure is presented in a luxurious window box. I first came across this recent series from Pop In A Box (PIAB). I noticed their various subscriptions which are placed into several categories such as heroes, Marvel, movies, Disney, etc… Each month you can choose to receive one Funko Vinyl figure or a higher quantity for the avid collector and whatever package you choose you’re guaranteed complete satisfaction and enjoyment. You can also purchase PIAB stickered exclusives and also a chance of obtaining a special ‘chase’ edition. Fear not, for you can choose your Funkos via a ‘pop tracker’ system which recognizes your purchases, your wants, your don’t wants and those Funko figures which you currently own within ‘my collection’. One morning I had a surprise delivery. When I say surprise it was because I couldn’t believe the quickness of their delivery service and a further surprise was waiting for me. I received a professionally wrapped box and I couldn’t wait to see what was hiding in there. 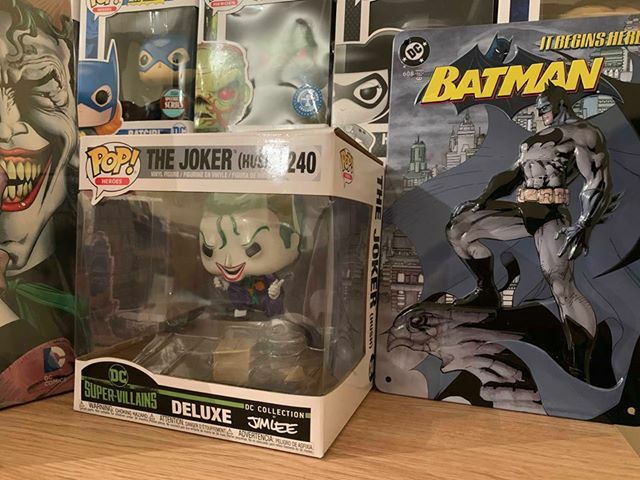 To my amazement as I opened the box flaps and I had to blink twice because I thought I was dreaming, initially I was dreaming but I received The Joker (Hush) Deluxe edition from the Jim Lee DC Collection. What makes this one so unique is that that The Joke is displayed knelt down on a wooden container, complete with his eerie grin. Vinyl for the collector. 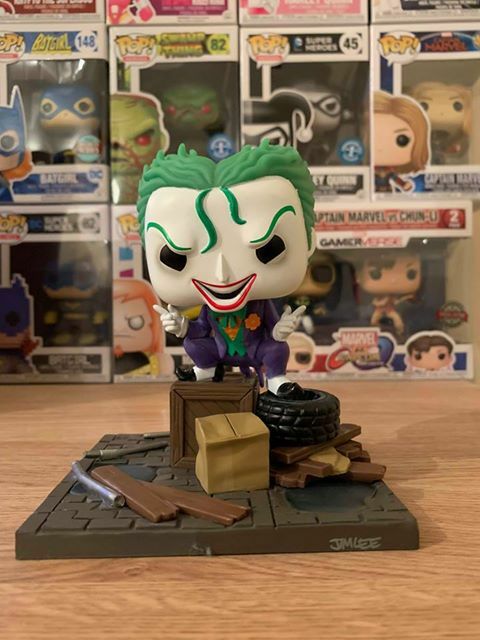 I also recommend you check out the other Exclusive items and subscribe to their heroes monthly subscription which automatically adds you to their VIP shop and within this shop you will see a host of special exclusive Funko Vinyl Pops such as The Joker (Hush) and related items, plus much more! Every little detail is recreated to perfection; the colors, pose, expression, etc… If you haven’t ordered from Pop In A Box I would highly recommend them. Enter the world of Funko Vinyl Pop collecting with PIAB. You will receive the very best in customer service from start to finish and most of all you are guaranteed something special and uplifting. If you are a first-time buyer, PIAB will help you through their online chat function, email, social media networks. They’re never too far away to make you the happiest Funko collector in England and overseas. 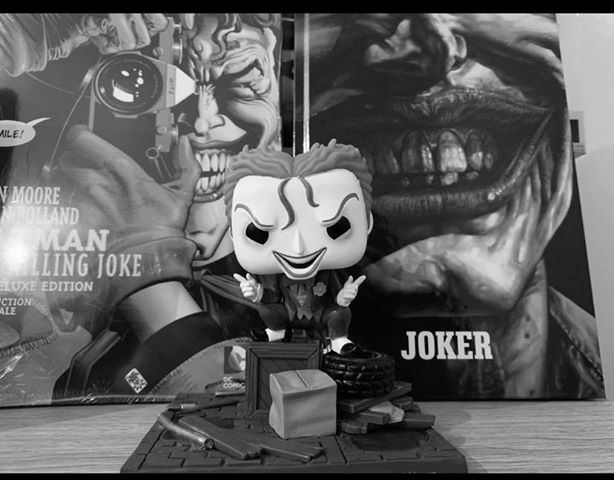 You can purchase THE JOKER (HUSH)- DC SUPER VILLIAN-DELUXE- DC COLLECTION BY JIM LEE from POP IN A BOX (PIAB) and you can also follow them at Facebook and Twitter, Instagram where you can find out more updates, giveaways and news. Don’t forget to also signup for the PIAB newsletter via the website.